On October 12-14, the ARRL will welcome members and friends to the 2012 ARRL National Convention in Santa Clara, California. Hosted by Pacificon and sponsored by members of the Mount Diablo Amateur Radio Club, this three-day event is sure to be jam-packed with excitement, exhibits and, of course, the ever-popular ARRL EXPO. Use this handy guide to find ARRL-sponsored activities and exhibits throughout the event. Read more here. From an Amateur Radio perspective, the 2012 World Radiocommunication Conference (WRC-12) was very successful. According to IARU Secretary Rod Stafford, W6ROD, the IARU Administrative Council will meet in the next 45 days and will address the agenda items for the 2015 World Radiocommunication Conference (WRC-15) with an eye to building the best strategy for dealing with those items in a way that is most favorable to the Amateur Radio Service. While the IARU will be watching all agenda items in 2015, there is one agenda item that focuses on the Amateur Radio Service, and another four that may have an effect the Amateur Radio Service. Read more here. Sean Smith, KG4WSS -- shown here in his Facebook photo -- was killed on September 11 in an attack on the US Consulate in Benghazi, Libya. Sean P. Smith, KG4WSS, of Falls Church, Virginia, was killed when the US Consulate in Benghazi, Libya, was attacked on September 11. He was 34. Smith was one of four Americans, including Chris Stevens -- the US Ambassador to Libya -- who was killed in the attack. Smith, a native of San Diego, enlisted in the Air Force in 1995 at age 17. He served six years as a ground radio maintenance specialist, including a deployment to Oman, before leaving the service in 2002 as a staff sergeant. He was awarded the Air Force Commendation Medal. 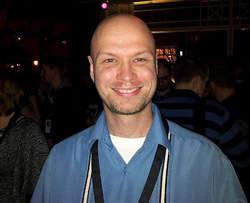 Smith, who had worked at the State Department for 10 years, was in Libya on a temporary assignment when he was killed. Prior to his temporary assignment to Benghazi, Smith served for the State Department in Brussels, Baghdad, Pretoria, Montreal and The Hague. Read more here. 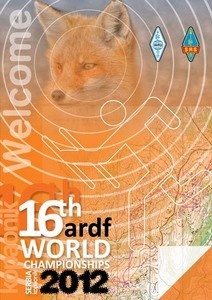 The sport of ARDF -- also called foxtailing, foxhunting and radio-orienteering -- has undergone many changes since the first World Championships in 1980, but the basics remain unchanged. A championship course has five transmitters in a mapped area of rural and wooded terrain, typically 1000 acres or more. When Fox #1 comes on the air, contestants set out from the start as and try to be the fastest to "punch in" at all required transmitters and then make it to the finish line in another part of the forest. Read more here. 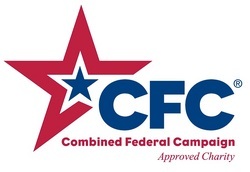 For the past 11 years, the US Office of Personnel Management has designated the ARRL as a participant in the Combined Federal Campaign (CFC). This campaign for federal government civilian employees, US Postal Service workers and members of the military has generated almost $192,000 for ARRL programs since it first became an option for federal employees to donate to the League. The CFC provides an easy way to support the ARRL's effort to represent its members and all radio amateurs. Read more here. The crew of the hit ABC comedy Last Man Standing is planning a radio event on Sunday, October 28 to kick off the show's second season. Last Man Standing features Tim Allen as Mike Baxter, KA0XTT. According to Last Man Standing Producer John Amodeo, NN6JA, Mike's station is back this year with even more gear. In addition, all the antennas that were in the catwalk last year have been relocated to the studio's roof. Using special event call sign K6T, the show's crew will operate on HF, VHF, UHF, D-STAR, EchoLink and IRLP to communicate with fans of the show; 12 members of the Last Man Standing crew are licensed amateurs. Members of the Los Angeles-based PAPA System will assist the crew with running the event. The crew will use several PAPA System repeaters to run analog VHF, UHF and D-STAR communications. They will also be monitoring the Disney Amateur Radio Interconnect repeater system, which has repeaters in New York City (W2ABC), Florida (WD4WDW and WD4WDW-B/D-STAR) and California (KB6AJE), as well as EchoLink capability. A list of frequencies and an operating schedule will be posted on the KA0XTT Facebook page and on Amodeo's Twitter feed in the next few weeks. A special QSL card will be sent to all hams who contact K6T; hams do not need to send a self-addressed, stamped envelope, nor do they need to send postage or "green stamps." Last Man Standing begins its second season on Friday, November 2 at 8/7 Central. he Sun, as seen on Thursday, September 20, 2012 from NASA's SOHO Extreme Ultraviolet Imaging Telescope. This MDI (Michelson Doppler Imager) image was taken in the continuum near the Ni I 6768 Angstrom line. The most prominent features are the sunspots. This is very much how the Sun looks in the visible range of the spectrum. 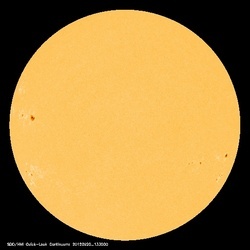 Tad "The summer Sun knows me by name" Cook, K7RA, reports: The average daily sunspot numbers dropped this week, from 83.1 to 56, while the average daily solar flux declined from 118.9 to 101.4. The latest forecast shows the predicted solar flux at 115 on September 20-22, 120 on September 23-25, then 125 and 130 on September 26-27, and rising to 140 on September 28-October 1. On October 2, it drops to 135, 130 on October 3-5, and back down to 125 on October 6-7. The flux values then dip below 100 on October 14-16, and peak again around 140 on October 25-28. The predicted planetary A index is 10 on September 20, 12 on September 21-22, 10 on September 23 and 5 on September 24-28, 10 again on September 29, and 5 on September 30-October 2. Look for more on the ARRL website on Friday, September 21. For more information concerning radio propagation, visit the ARRL Technical Information Service Propagation page. This week's "Tad Cookism" is brought to you by The Brady Bunch's It's a Sunshine Day. On September 19, the ARRL DXCC Desk approved the following 2012 operations for DXCC credit: 3B8/IW5ELA (Mauritius); E40VB (Palestine); JY8VB (Jordan); 9A8VB (Croatia); E7/UA4WHX (Bosnia-Herzegovina); 4O7VB (Montenegro); Z38VB (Macedonia); ZA/UA4WHX (Albania); YU9VB (Serbia); EY8/UA4WHX (Tajikistan), and UN/UA4WHX (Kazakhstan).